Muskerry News | 200 years to celebrate at St. Senan’s Inniscarra! 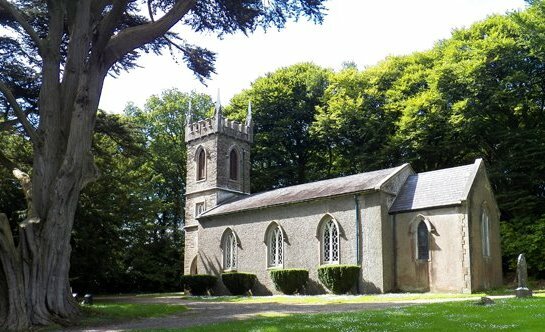 St Senan’s Church of Ireland, Inniscarra, are celebrating their 200th anniversary with an exciting programme of events and you’re all invited! Just to the west of Canon’s Cross, on the right hand side of the road and approached by a short avenue, is St Senan’s Church (Church of Ireland). In a beautiful tranquil setting almost hidden among the trees, its presence is often unknown to the many who pass along the road below. Built in 1819 at a cost of £923/1/6½d to accommodate 120 people, it replaced an earlier building which still stands in ruins a mile to the east near the confluence of the Rivers Lee and Bride. The bell from that church, dating from the 17th Century, hangs in the tower of the present building. The chancel was added in 1893, and its east window, recounting the story of the Good Samaritan, is in memory of Doctor Richard Barter who founded the Hydro in St Ann’s Hill Blarney, and who died in 1870. The side windows commemorate his grandson, Doctor Richard Barter Kent, who also ran the Hydro for many years and who died in 1916, and his wife Madeline. They are buried in the graveyard along with many others who resided in the Hydro. The Beresford family had a long connection with Inniscarra. Reverend George de la Poer Beresford was rector from 1799 – 1826 and his name appears on the foundation tablet over the main door of the church. Also during his time, about 1818, the Glebe House was built. This magnificent mansion, now more familiarly known as Inniscarra House, is pleasantly situated on the north bank of the Lee with th e brow of Garravagh on one side and the height of Currabeg on the other. George Berresford was succeeded by his son, Reverend William Beresford, who was rector until removed from his post by the Archbishop of Dublin. He was later deported to Australia where he gained some fame as a journalist and as editor of the Freemantle Herald. Memorials in the Gallery commemorate members of the Coulthurst family who at the time lived nearby in Ardrum House and who were among the most influential landed proprietors in mid-Cork during the 19th Century. A much appreciated addition to worship in Inniscarra was the arrival in 1994 of the 125-years old organ from Christchurch Magourney (Coachford), now closed, which was restored and is now in perfect working order. Today St Senan’s is part of the Carrigrohane Union of Parishes with, as Rector, Canon Ian Jonas based in Carrigrohane assisted by his associate minister Reverend Robert Ferris who works from Blarney. Services are held on the Second and Fourth Sundays of the month. Visitors are always very welcome. Special services take place in Holy Week, Harvest and at Christmas. In recent years the Annual Community Carol Service has become very popular, as has the concert “Music Among the Trees” held in late May. A new extension has just been built on the back of the Church, which includes a meeting room and toilet, due to be dedicated by the Bishop later in the year. Saturday 27th @ 8pm Directly from the Appalachian Mountains of West Virginia, USA. Probably the best singer and guitarist of country, bluegrass and folk music that you’ll ever hear. Greg Blake has been performing professionally for over thirty years. This award-winning artist is a frequent visitor to Ireland and returns to Ireland in April and May 2019 to perform his Irish tour. He is the real deal. You are in for a treat where you can get up close and be enthralled and won’t be disappointed with this great entertainer and storyteller. Come and hear him for yourself at St. Senan’s Church Of Ireland, Inniscarra, on Saturday 27th April 2019 with support guests John Nyhan and Pat Kelleher. Tickets at the door, or pre-booked on 087 7921771. Friday 31st May @ 8pm St Senan’s Festival Weekend FESTIVAL WEEKEND Celebrating music and our living planet with ‘Music among the trees.’ Sunday 2nd June @ 11am United celebration and parish picnic The Leaves of the Trees are for the Healing of the Nations. Hope for a Greener World come and hear the experts and learn simple ideas for caring of creation. Saturday 8th June11am to 4 pm ‘Flowers Among The Trees’ hosted by Ballincollig Flower Club. €5 Entry in aid of Pieta House and Breakthrough Cancer Research.